In the age of breaches and increased cyber attacks, security professionals are looking for the best ways to secure their organizations and prepare against upcoming cyber threats. Join this panel of experts are they look back the biggest events of 2017 and provide their recommendations for CISO's on what to look out for in the next months and how to improve their organization's cyber security in 2018. Hacking and malware attacks, including ransomware attacks, are a major cause of breaches in 2017. With high-profile ransomware attacks on the rise, enterprises and small businesses worldwide are looking to better secure their data from cyber criminals and more nefarious attackers. This presentation will cover how DNS surveillance works and how it has been operationalized to track over 4 dozen malware families. The results from this surveillance is given away for free and best practices will be covered in how best to use this data. Internet of Things devices are notoriously lacking in security, making them easy targets for attackers to hijack and leverage in DDoS attacks. How have cyber attacks evolved in the last few months? What is the impact of the IoT devices on cybersecurity across organizations and industries? How can we better protect our organizations when it comes to attacks coming from the IoT? This panel of security experts will discuss the current state of IoT security and the IoT trends seen across industries. Join this interactive Q&A session and discover where the vulnerabilities lie and how we can improve cybersecurity. This past week we saw the emergence of a worm-based ransomware attack in wannacry that showed us how damaging these attacks can be to critical services society relies on. This presentation will cover the recent wannacry attacks and what we have learned from them. In addition, we'll discuss the evolution of ransomware in recent years, focusing on attacks targeted against enterprises and so-called "high-interaction" ransomware attacks. Attendees will also be given a path forward of protecting their institution. A discussion of the renewal of Business Continuity and Disaster Recovery as a result and what this means for fintech going forward. The 10th Annual Verizon Data Breach Investigations Report (DBIR) was just published; the industry gold standard in security incident reporting for the past year. The report covers incidents all over the globe and in all verticals. This webinar will cover the findings of the report but focus in on the key details enterprises need to know right now to protect themselves against the most relevant threats for the upcoming year. Cloudflare revealed a serious bug in its software in February, which caused sensitive data like passwords, cookies, authentication tokens to spill in plaintext from websites using Cloudflare Content Delivery Network (CDN). Those defending against cyberattacks are overwhelmed by the shear volume of incidents to respond to. It is so bad that it has been said there may be as many as 1 million unfilled cybersecurity jobs. Machine learning and automation is often heralded as a way to deal with this problem so that many incidents can be dealt with requiring pressing a button. While there is much promise is machine learning there are also many perils that need to be considered. Attackers know how we defend ourselves and they do use our defenses against us. 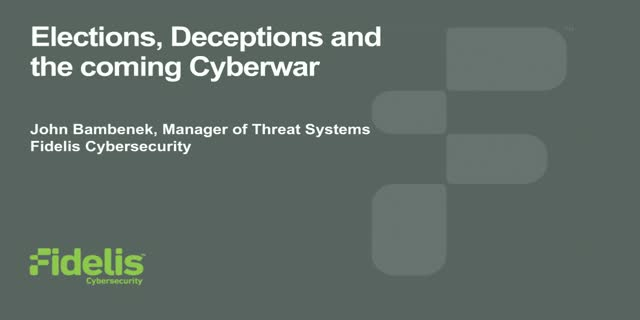 This talk will cover some of the open-source tools and techniques available for organizations to use to defend themselves while keeping in mind how attackers could undermine our efforts. The US intelligence community has released their summary of the DNC breach and the election-related hacking and there have been additional disclosures about the attacks. This webinar will be the latest on what we know, what we don’t know and what many are merely speculating about. We’ll take a look forward for upcoming European elections to get a perspective on what can be expected there in the coming months. Bambenek Consulting is an IT consulting firm focused on cybersecurity and cybercrime. Every day, there is another story about another company having their banking accounts drained, someone having their identity stolen, or critical infrastructure being taken offline by hostile entities. Led by IT security expert, John Bambenek, we have the resources to bring to your business so you can be sure your organization and your customers’ data is safe. And when disaster does strike, you know you can count on us to be with you every step of the way as you recover from an incident.